Analysis: Two moments in a single day pointed to America's relinquishing of its role as the globe's top cop. BUENOS AIRES, Argentina — America once advocated for a "new world order." Now, it seems to prefer no world order. The transformation took nearly 30 years, but it was encapsulated Friday in two moments: an exultant greeting between the Russian president and Saudi crown prince here, and the death of internationalist President George H.W. Bush in Houston. It was at the opening of the G-20 summit here that Vladimir Putin and Mohammad bin Salman signaled with a bro slap — half high-five, half handshake and all scofflaw — that they will do as they please without fear of repercussion from President Donald Trump or any allies who would need his help to make sanctions stick. Just hours later, Bush — who had announced an allied invasion of Iraq in 1991 by calling for "a new world order — a world where the rule of law, not the law of the jungle, governs the conduct of nations" — died at the age of 94. The reasons for the transformation are complicated — a combination that includes Trump's belief in national sovereignty, his affinity for authoritarian leaders, the relative decline in American power and possibly Trump's personal interests — but the result is clear, Trump critics say. "It's deeply disturbing that this president has become a global enabler of despots," said Rep. David Cicilline, D-R.I., who is a member of the House Foreign Relations Committee. "He praises them as if they're close personal friends and then he fails to do anything to stop them or even condemn them when they commit some of the worst atrocities in recent memory." Putin has tampered with Democratic elections across the globe, including in the United States, annexed Crimea from Ukraine and most recently detained Ukrainian ships and sailors operating in waters that were not his. A recent CIA assessment found with "high confidence" that Saudi Crown Prince Mohammad bin Salman ordered the murder of Washington Post journalist Jamal Khashoggi at a Saudi consulate in Turkey in October. Rather than publicly condemn them on the global stage provided by this summit — or simply confront them — President Donald Trump chose to maintain his distance from them by keeping them off his official calendar. Trump has refused to blame bin Salman for Khashoggi's death, citing Saudi investments in U.S. goods as a reason not to upset the relationship between the two countries. His son-in-law, Jared Kushner, has become close with bin Salman, and Trump's business has benefited from Saudi dollars over the years. And while he attributed canceling a planned meeting with Putin here to the Ukraine situation, Russia's foreign ministry suggested Trump did it because he couldn't afford the political optics in the days after former aide Michael Cohen pleaded guilty to lying to Congress about Trump's efforts to develop real estate in Moscow while he was running for president. Trump long denied having any financial interest in Russia, even though he pursued business opportunities there for many years. 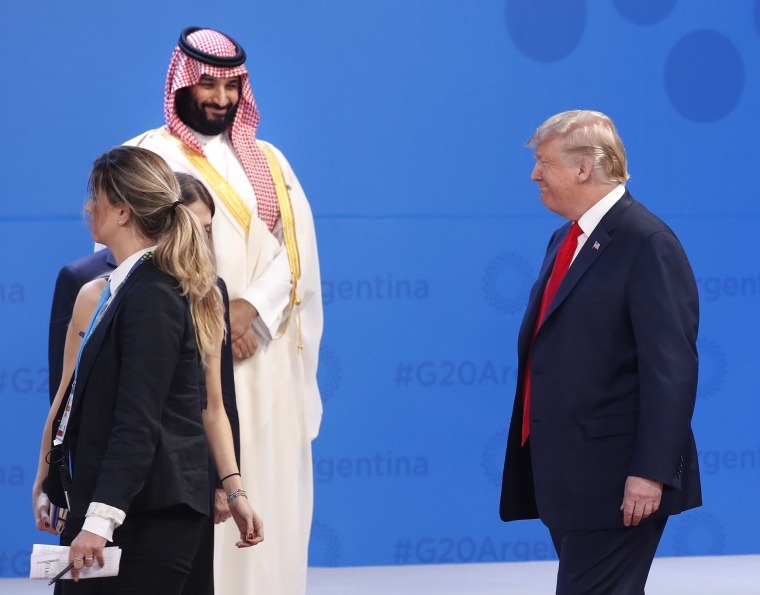 Whatever Trump's calculus, Putin and bin Salman seemed to be celebrating like bank robbers who had just pulled off the heist of the century while strolling past armed guards. "Opportunist leaders like Putin, MBS, and others take advantage of ... the void created as America retreats from internationalism to nationalism, the appetite for flattery of a needy president, and the greed of a self-dealing (and potentially corrupt) one," David Rothkopf, a visiting scholar at the Carnegie Endowment for International Peace and a former CEO and editor of Foreign Policy magazine, said in a text message. "Thus, by virtue of his ideology and the deficiencies of his character he has transformed America's historic role and created a space for some of the world's worst bad actors to flourish and violate international laws and norms of behavior with impunity," he added. Trump's kid-glove treatment of autocrats — Putin, bin Salman, North Korea's Kim Jong-un and others — is all the more apparent because of his tendency to impose economic and diplomatic pain on long-standing American allies. "One of Trump’s most troubling instincts is to support authoritarian leaders at the expense of democratic leaders," said retired Ambassador Nicholas Burns, who served presidents of both parties. "He is close to MBS and refuses to criticize Putin, Kim Jong-un, [Chinese President] Xi [Jinping] and [Turkish President] Recep Erdogan. At the same time, he has been incessantly critical of [U.S. allies]. He has turned American foreign policy on its head. It is weakening the U.S. and diminishing our credibility." It's bad enough for advocates of the old American-led liberal world order to see bin Salman and Putin flaunting their immunity from true sanction by the leader of the free world. But there's additional danger in the prospect that Trump's quiescence will give others the idea that they can get away with whatever they want, too. "Other nations are watching this," Laura Rosenberger, director of the Alliance for Securing Democracy and a former foreign policy adviser to Hillary Clinton, said. "If we send signals that this sort of behavior will not be met with consequences, there’s no reason for others not to adopt these practices." And, she added, "this is essentially a playbook that anyone can pick up and use if they want to."